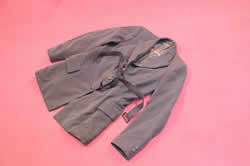 Ladies grey whipcord jacket. Single breasted, three buttonholes and buttons. Buttonhole on right lapel, felt backed collar. Two front side button tie pockets. Belt with metal buckle in left side pocket. From neck 67(l) x at waist 42(w)cms. Sleeve 47 (l) cms. Shredded label inside back reads "PAISLEY'S LTD GLASGOW"
This jacket was given to Mick Tighe by Rhona Weir, wife of the author and TV personality, Tom Weir. It had been given to Rhona by a Miss MacFarlane, one time president of the Ladies Scottish Climbing Club. Miss MacFarlane and Rhona had worn it on various mountaineering expeditions, come rain or shine. Whether or not something waterproof went over the top, we are not sure.